In the post-9/11 environment, the figure of the Muslim woman is at the forefront of global politics. Her representation is often articulated within a rights discourse owing much to liberal-secular sensibilities—notions of freedom, equality, rational thinking, individualism, and modernization. Muslim Women’s Rights explores how these liberal-secular sensibilities inform, shape, and foreclose public discussion on questions of Islam and gender. 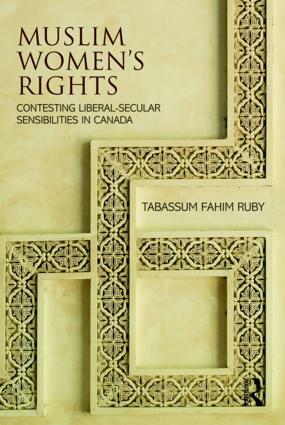 The book draws on postcolonial, antiracist, and transnational feminist studies in order to analyze public and legal debates surrounding proposed shari‘ah tribunals in Canada. It examines the cultural and epistemological suppositions underlying common assumptions about Islamic laws; explores how these assumptions are informed by the Western progress narrative and women’s rights debates; and asks what forms of politics these enable and foreclose. The book assesses the influence of secularism on the ontology, epistemology, and ethics afforded to Islam in the West, and begins to trace possibilities by which Islamic family law might be productively addressed on its own terms. Muslim Women’s Rights is a significant contribution to the fields of both Islam and gender and the critical study of secularism. Tabassum Fahim Ruby is an assistant professor at West Chester University of Pennsylvania, USA. Her research focuses on Islam and gender discourses, liberal-secular epistemology, and globalization. Her most recent publications have appeared in Frontiers: A Journal of Women Studies, Women’s Studies International Forum,and Feminist Formations.